The state of Ohio has a rich history of success in Mixed Martial Arts and a plethora of Ohio-born fighters have had success on the biggest stage in the sport – the UFC. 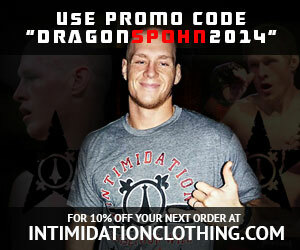 Among those UFC veterans from Ohio is Intimidation-sponsored Jason “Dynamite” Dent. A semifinalist on The Ultimate Fighter 9, Dent spent two separate stints in the UFC facing Roger Huerta & Gleison Tibau in 2006-2007 and then submitting Cameron Dollar and falling to George Sotiropolous in 2009 after TUF 9. The owner and operator of GriffonRawl MMA Academy in Mentor, Ohio, and official Intimidation retailer, Dent was recently highlighted in an analysis of submission victories by UFC vets from Ohio. As the biggest supporter of Local MMA in the state of Ohio and throughout the Midwest, the list of Ohio’s UFC veterans is full of fighters who Intimidation has sponsored over the years. Not taking a backseat to any of those names, according to the article’s research, Dent leads the list with career professional submission wins. Read the entire piece here.